Unlike starting other tree farms and orchards, starting a banana farm and growing bananas are easier and less complicated. Although growing bananas still require ones attention, the level of skill required is not as intensive as other trees. Here are a few guidelines in growing bananas and starting a banana farm. The first thing to consider in starting a banana farm is looking for the right climate. Bananas cannot thrive in an environment that is too hot or too cold. The ideal climate for bananas is the tropical climate with temperature ranging from 26 to 30 degrees Celsius. Below 14 degrees and the bananas would die. Banana plants also need good irrigation and humidity. The banana plantation must have a good drainage system as they need to be watered at least three times a day to keep the humidity. A rich, naturally fertilized soil is the ideal for planting bananas. If such is not available, one can create compost and add chicken manure. Banana plants also grow best in bunches or groups because they protect each other from the harsh rays of the sun. It is important to create an environment where the banana plants are sheltered either because they are bunched up together or there are other trees to protect them. It is important to maintain the humidity of the banana plantation. Considering that a banana plant is not a tree but a type of herb, they cannot actually be grown from seeds like most trees. Banana plants are grown through suckers. Suckers are those that grow from a dying, mature banana plant that can be transplanted and re-grown. They may be considered as baby plants that are used to start new banana plants. Choose suckers from plants that are vigorous. They should have small, spear shaped leaves and are about four feet high. There is a corm at the bottom of each mature banana tree. In transplanting a sucker, it is necessary to cut downwards and get as much corm and root as possible. Plant these and cut or decapitate the sucker to facilitate good evaporation. Keep around two to five meters between planted suckers. In the early days of your plant, keep them moist but not too wet as they don’t have leaves yet to evaporate the water. As the banana grows, it is important to protect it from strong winds. It is also important to keep it well watered. 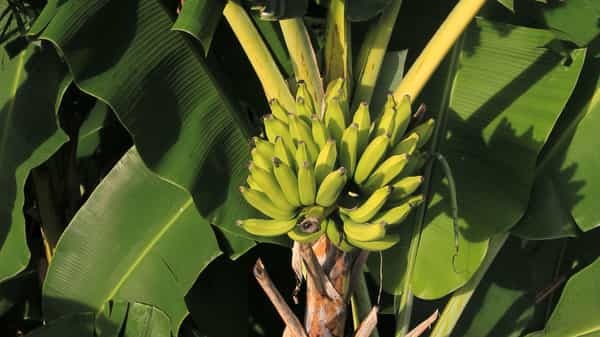 One can also sprinkle fertilizers every now and then but mostly throwing the bananas dead leaves back into the plant is enough to sustain the rich quality of the soil. Unlike other trees, bananas do not need complicated pruning. Just remove dead leaves and dead plants near the banana. Also remove suckers from the plant keeping only one or two that have spear shaped leaves. I have a plot of 25 acres of land left out for nearly 25 to 30 years growing nothing ( abundant Paddy land ) It's just bordering a lagoon, which of course has a humid climate, this land was affected by the recent Tsunami. Is this place suitable for Banana Farming, Will there be any danger from the wild animals specially the wild monkeys. This article about Banana Farming looks very promising, but need little more advice. i have a diesel engine but dont have enough resources to purchase land and the remaining equipment. how do you assist? i have about 20 acres for bananas in southern mexico on the pacific coast. i just have a hard time trying to sell the fruit it seem that the price is never right right now the price is like .70 to 1.00 peso per kilo? to you is how do i find out if there's a better buyer out there? my farm is within the tropics. i need advice on where to get a developed high breed seed that grow fast and produce at maximum yield. living in Tanzania east africa, where can i get good breed or which department is well concerned in ministry of agriculture or is there any research NGO dealing with banana seeds and products? I WANT TO MAKE A BIG SCALE OF BANANA FARM IN SOUTHERN PROVINCE SIERRA LEONE. WEST AFRICA, THANKS IN ADVANCE. i want to start a banana farm in Botswana. i would like to know if its possible. Want to establish a banana plantation in Zimbabwe, Chipinge district. Want to know where to get seedlings and inputs particular for bananas. We have 2ha we would like to dedicate to banana along the mazowe river, just after Mazowe dam on the way to Bindura in Mazowe, Zimbabwe. What variety should we buy and from where. What fertilizer regimes would we require in this area? I need to understand rudiment of banana plantation. the estimated cost of starting it and various products you can derive from banana product. Warri, Delta, Nigeria. We would like to start a Banana Farm, with an initial 16 Ha in Nyimba, Eastern Province of Zambia. We have well drained sandy loams and a good source of water. I require a 3 year business plan to help me source for funds , analyze business risks and of plantation growth. @ajewole, Yes in every farming business you can get profit if you do it with proper knowledge. The main difficulties in this farming is bananas start to grow downward and the plant grows upward, the stems made with layer and layers of leaves warped around each other. Though the stems are quite heavy and not enough strong like other trees, it must be supported with poles so that it can handle the weight of the plant when it becomes heavier with growing fruits. Second thing is temperature, it should be 80F and 3 1/2 inches of rainfall per month. I own and operate a successful 400 acre banana farm in Belize Central America. I have operated it for twenty years. I am getting older and would like to sale it. It comes with a three year contract for sale of all bananas. I would like your contact information Mr. Strickland and any other information you can provide. Very important - Have the land in which you intend to undertake farming in your name. Own it..
sir i want to know about the banana farming conditions and from where we get the plants and other information related to this..
which potato variety is suitable(N-Genetic -M) for env. (20 deg.cent. -28 dec. cent. )in Laos. thanks. Thanks for your ideal solutions for beginners like me. Sir I intend writing a business plan on plantain plantation on a three (3) acres of land and does not know how to go about it more since its about raising or sourcing for fund. Sir I shall be most grateful should you help with a comprehensive details that will aid the writeup. Lagos. I have 2 acres in Ogun state I intend to start a banana farming business. Need assistance especially on how to get market. I want to go into banana production, how will go about it. . I would like to start a banana farm at Old Mutare in Manicaland province Zimbabwe. Winters are cold but the rest of the year its hot. Can I succeed with protection in winter? i would like to start banana farm at chemelil, in lower nandi hills 2 acres . eldoret kenya. How many suckers will you advise me to plant on 1 hectare of land in Nigeria. Please respond to this. i have got 1 hector land i need to plant Bananas where can i find plants in Kzn? Hi, I am Manju, i have land in Karnataka. i am facing too much problems from monkeys. Please let me know how can i protect my banana plants from monkey. Good day, i planned to start plantain farming in Nigeria, Ogun state Ifo. On an acre how many seed am i suppose to plant? Sir do you have manual and business plan? I would like to start farming of banana trees. I have enough land more than 30 bighas, near sundarban. can u help in this regards!!! we are a partnership farm. its a salty land near kumir proklpo. Am in Nigeria ,pls i want to know if there is any specie of banana or plantain that can produce fruits up to (3)three or more times a year ? And i also want to know the pests that can disturb the plant and the possible control of such pest(s). If possible ,i'd like to get detailed guideline on how to care for plantain and banana tree(s). Am in Uganda, would like to start with one acre with sweet bananas, how many plants do i need? How long does it take, and what is really necessary? I am about to start a plantation/banana farm in eastern region part of Nigeria in Africa. But the recent flood(2012) of 10 feet height took over the place for 2/3 months, because is very close to river side. Though the water flow in during raining season and have the height of water of about 3/4 feet height. Will this place be suitable for plantain/banana farming? Pls i need your assist so i can move ahead. thank you. happy new season to you all, I need help on how to get 1 or 2 acre of land in ogun or ibadan of 80k per acre and good for plantation. Am looking for banana seed for my plantation. are you able to supply? how much per plant? Thanks. am about to undertake a banana farming project. i would like to know where i can find banana plants and how much they cost per plant. Thank you. Am in Zambia Kabwe, I need connection to the banana farm prompters in Zambia. Please I need a write up to start a banana plantation of 40 hectares. I am in Douala, Cameron. I came from south west Nigeria, am working on getting some pieces of land. How many banana suckers can be planted on a plot of land and how many years can it last before diminishing returns set in? Also is there any ready made market for the product as well? How do i get started? Please send to me necessary information on how to start the business. is it good to lease the land or to buy the land to be used. 1. Will G-9 banana be good option? 2. Can the suckers from the motner plant be used to grow more bananas? 3. What spacing to be used per acre if I am using drip irrigation? I am planning to get G-9 plants from Cadila Pharmaceuticals Ltd. - Agro Division. What is the yield expected from the Tissue Culture plants. i want to grow banana suggest me what type of banana should i grow for more profit. please i want you to advise me on plantain plantation on a plot of land, will it be enough and how many suckers would be enough to be planted on that a plot of land here in Ogun State, Nigeria. please i need your response on how to go about it. Banana farming is more profitable compared to other farming businesses but one need to have a large plantation to maximize the returns. In other words the more the plants the more the profit. I live in south Florida of sandy soil where is fit for growing banana. I like to extend commercial banana plantation. what kind of watering method is adequate to grow since banana is affected by much of water supply- micro jet or drip, and how much? Can you guide me in details? Thank you. I am very keen to start a banana plantation in the Natal Midlands on 2.5 Ha. Require planting stock/advice/yields etc. Any help will be appreciated. I am going to cultivate banana farm in a small quantity which land is waterable on the ground ,will it suitable for ? I am from Nepal. I have 2 acres of sandy black soil, it is a river valley, it is hot and humid, and plenty of rainfall, it is tropical climate, I would like to grow banana as a commercial crop, but have no idea of getting good seedlings. I am near Bongaigaon, Kokrajhar Assam, my place is known as Gelephu Bhutan, please advise me to find the best seedlings or suckers. The suppliers can contact me on my mobile phone 0097577376137 but the plants must be certified by the horticulture division because my country will not allow import without certificates, thanks. Hello, am ramie pastorin wanting to buy banana seedling nearby my place pangasinan, philippines. i've got 2 hectares of land ready for planting. I came from West Africa (Nigeria). I want to go into planting of banana. How many Suckers of bananas can be planted on an hectare of land? I am from Mauritius Indian Ocean .Looking for ideas as am in banana plantation. Very interesting and helpful ideas. I am from Liberia West Africa. ten years ago I started a cut flower garden, I invested substantial amount of money in it with virtually no return. Last year august 2013 as I walked through our back yard I spotted a plantain tree, my brother had planted few years ago, its healthy growth and fruit made me regretted the time, effort and money wasted. By September last year , I brushed the flower and planted the first sixty suckers which I will use for multiplication this year 2014. please advice. How can i get good variety of plantain in Delta state Nigeria.08058234646. I would like to know where I could get banana saplings. I reside in Aritao, nueva vizcaya, Philippines. I have a 25 acres of farmland and I would like to start up a banana plantation. my farm is in the damp area. what am I supposed to do cause I don't know the type of seedling am grow and how to prepare the land. please advise.